WWD was granted the ultimate chance (as always) to have a rare glimpse into the sketches and fittings and all-to-do of Christian Lacroix for Elsa Schiaparelli's couture come-back. For both of them. There will be 18 looks to be displayed in a sort of exhibition instead of runway show. 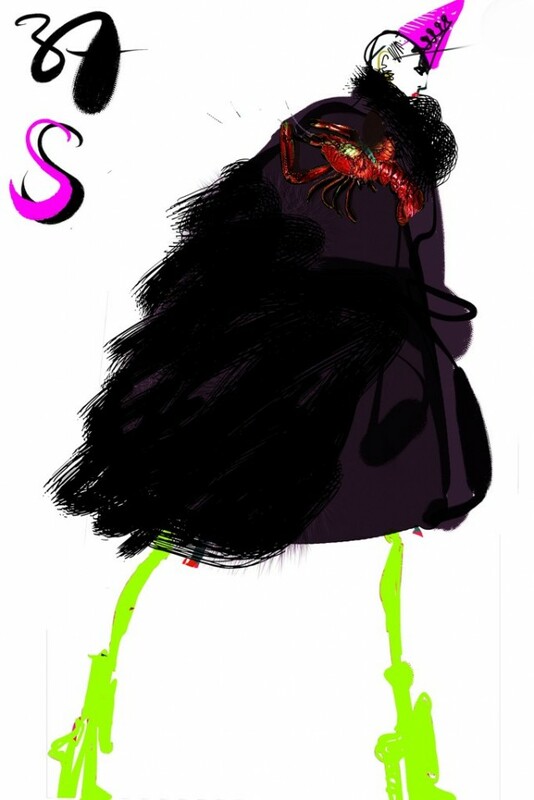 The designs include a voluminous, textured black garment adorned with Schiap's signature orange lobster. Lacroix told WWD, "It's as if it was a musical about Schiaparelli and I'm in charge of the costumes". The collection is unfortunately not for sale, but it is always like that to increase the buzz. Like we all need more. But recalling that Christian's collections in the pasts are more poetic with a lot of play with colours, this project is a worth-to-kill to see. It is an invite-only 3-day exhibit held at Musée des Arts Décoratifs, and only can be viewed afterwards by appointment only. Christian is set to be the first of many “creatives” to pay tribute to the house with special one-time only exhibits. But I think they should appoint him to be the house designer. People out there are longing his come-back fashion tour-de-force. Lots of people.